On the roads they are on the move. 4WDs towing tinnies all headed to the coast or the dams; tinnies with fishing lines wobbling in the draft. 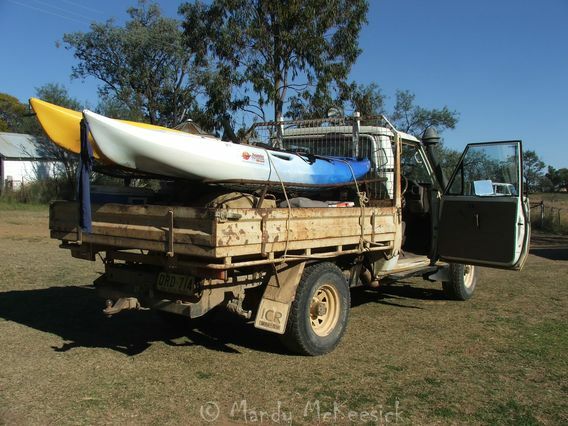 Muddy Landcruisers, trays packed with all things camping but all carrying the ubiquitous swags and eskies, and topped with a canoe or two. At the bottleshop in Goondiwindi a troupe of flash Holden and Ford V8 utes line up, decorated with stickers proclaiming a love of R.M Williams, Winchester and Bundaberg Rum. Their owners, dressed down for the holidays in thongs, shorts, blue singlets and black hats, are pushing aside the swags and emptying the hotel of beer and bundy. They are enroute to a B&S and it is probable that the only water they will find will be the melted ice at the bottom of the eskies. 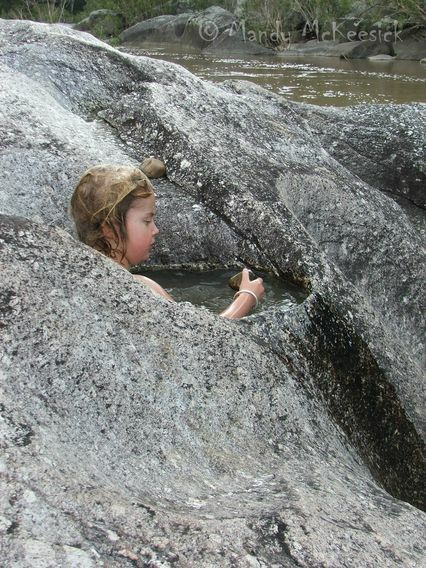 At Kwiambal the Macintyre Falls roar and the Severn River swirls and boils through granite rock, scouring spa baths. On the Lemon Tree campground squeals pierce the air as tiny commandos take to each other with water pistols. Larger commandos too. 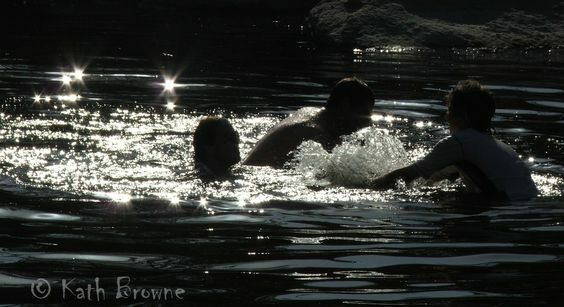 In a grubby waterhole on Rocky Springs Bo tows children around, the kids clutching at his tail – a Bo Tow. Back at the house he leaps into a big plastic tub – his private pool. The horses, Cobey and Desley, paw at water in the dam, splashing like children themselves, then gargle bore water straight from the hose. It may be February but in Moree the tourists still brew in the hot pools as the cicadas scream incessantly; 40o air temperature; 38o in the baths. Cricket dominates the air waves, hot water comes out of both taps, watermelon sales skyrocket, and the tennis players wonder why they have come here at this time of year. This is when we head to water. This entry was posted in A Rocky Life and tagged head to water, holidays in australia, kwiambal, moree hot pools, summer in australia. Bookmark the permalink. Wow, you are in a deep freeze. I have never experienced temperatures that cold. So the water tennis hasn’t caught on yet? Yes, it is usually the larger commandos instigating the ruckus; and then wondering why the tiny ones don’t want to stop! I love the photo of Cobey, is it? I remember way back when my friends and I would ride our ponies and horses down to a place called Whitford’s Brook. There was a swimming hole deep enough our mounts could stand it in it and splash around. 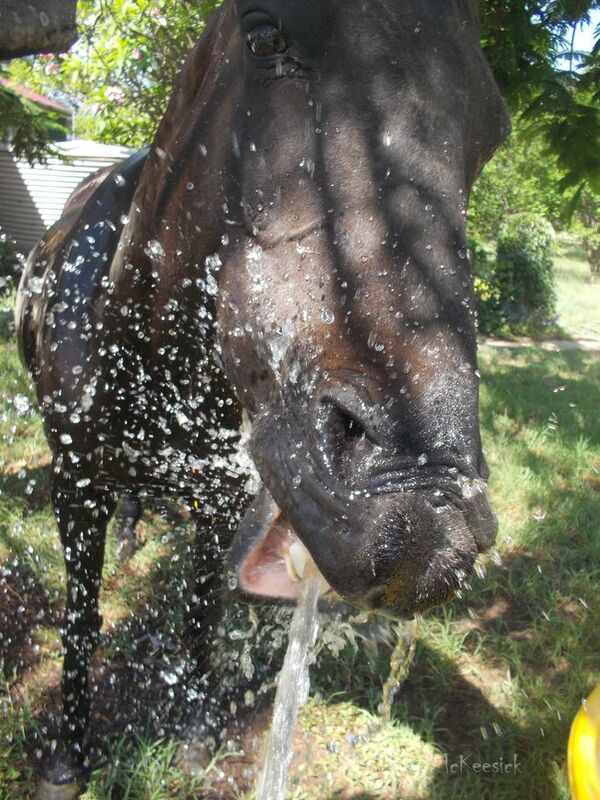 Gigi the Pony would stick her whole head underwater. Your description of Cobey on his page fits her personality. I wore a scar for a while from a barbed wire fence she dumped me off into. Rain here in our part of western Oregon today, but we are below normal for the year. Yes that photo is of Cobey – always got to be the clown. We have been getting good rain this summer – hope Oregon can get its share as well.